When it comes to choosing a product that suits an environment surrounded or immersed in water, there are different factors one must consider. Water resistance, specific fabric treatments for keeping shape, and other such design means help support usage in these environments. There are many different activities and categories that surround water sports, water activities, and submerged environments, with each calling for different inclusions that others may not require. This is where deterring the difference among products and categories can make a huge mark on usage. Below we will introduce 24 different products extending from 12 subcategories. Each subcategory will break down an activity into a certain space, helping the user assess usage with ease. We will be providing both men's and women's products, helping any user find their prescribed fit for a certain area of use. When it comes to applying a footwear option for swimming, you want something that is both light and helps you emit your natural movements. One of the most natural fits on the marketplace comes from Vibram. Their five-finger models cater directly to the shape of the foot, extending pockets for the toes to fit the exact mold. Their KSO EVO Cross Trainer model makes for the perfect fit for the swimming space. This model is made from both polyester and fabricated means, helping it to apply the shaping in the outer shell, yet remain flexible to fitting. This gives the user an applied sense of construction that really allows for flexibility in fitting and usage. This material stretches, helping to cater to different arch sizes, wider feet, and other such increases/decreases in sizing. The upper features an elastic band treatment, helping to form a lacing system. This lacing runs through looping and has a plastic adjuster. This allows for the user to adjust tightness and creates for the proper sense of holding/lockdown on the foot. The sides of the outer shell feature the fabricated design patterns. These inclusions help make the shell abrasion resistant, reducing the chances of cuts into the fabric. The outsole is treated to Vibram's XS Trek technology. This helps the undercarriage take finely place cuts and grooves, increasing the traction one has. The bottom surfaces of lakes, rivers, and oceans is often thick in slimy and slippery material. Sand is quite unstable, calling for an increase in traction. These finely cut grooves help cover the entire bottom of the shoe, allowing for simple standing on almost any of the described surfaces. The shoe is also molded to take on the natural design of the foot. This allows the user to keep their natural arch, reduce upon any pressures in the toe box area, and helps the user work to better their posture and stability/balance. This is the perfect model for swimming because you will hardly know the item is there and it makes for the lightweight material we need to host usage in a space that involves a lot of self-propelled movements. Coming from the women's side of the bracket, we have a Kealux model that is perfect for swimming. Kealux features branding in both the men's and women's spaces, providing products that scales the wonders of the outdoor world. Their production models surround heavily around the water sport space, making their Barefoot model the perfect fit for swimming. This model is made from rubber and fabricated materials. These two are teamed together to provide a solid foundation and support system at the bottom and a stretchable, resistant fabric surround the foot for an easy fit. The fabricated material comes with quick-dry drainage holes. This technology covers the entire outer shell, keeping the shoe from getting bogged down with water. This helps to keep the proper mold on the foot and won't weigh you down or keep you grounded in the water. The drainage also plays a role in reducing fatigue, which is a benefactor directly related to swimming. This drainage system also equates to a comfortable interior, teaming the flow to limit blister formation and other such ailments extending from build-up. The soles create for intriguing designs with this shoe. First off, there is an insole that rests at the interior. It encompasses complete coverage from front to back, catering to all areas of the foot. It is also expansive, which is something that the user might not be used to. Once water enters the interior, the sole expands to keep a strong hold on the foot. Basically, think of this technology as an informed compressor that keeps you secure and locked down no matter the conditions. This technology is partnered with a rubber outsole. The outsole design takes on different waves, almost mimicking the hills on a roller coaster. This design helps to provide increased support at the heel, arch support at the midfoot, and an even-keeled toe box rest. The shaping may look a little strange, but the properties extending from this design stand to benefit the consumer. There are also grooves placed across the undercarriage of the outsole, allowing for traction upon any surface. When it comes to deciding between value plays, look no further than the Sami Studio brand. Their models feature built-in outsoles, keeping stability standards as a main concern. Their price range also scales to the low-end, creating the perfect fit for any budget. Their aqua shoes are designed for differing terrains, making them a suitable all-purpose play. This model is made from a Lyrica fabric, which boasts elasticity for a simple fit and reinforced material stacking for increased protection. The mesh cloth design keeps your feet comfortable in motion and won't risk rash or rubbing on the bare skin. This material build also makes them a candidate for a quick dry, giving them purpose by both land and sea. The elasticity rises to the insertion point, creating ease of access. A small loop is placed at the heel to help with fitting. To increase safety measures, this model hoists a complete outsole that extends from front to back. This outsole is made from a rubberized component, allowing it to host the proper, flexible form. The sole rises to create protection at the toe box, reducing stubbing and increasing protection in this region. The traction pattern takes on elements of grooves and circular designs to cater to the pressure points of the foot. This helps with shock reduction. The outsole is also treated to a slip-resistant coat, allowing you to find your footing on rocky and slippery surfaces. This design pattern is utilized to help the user create the solid foundation they need for land travel, while also hosting lightweight functionality for use in the water. This multi-purpose model is priced conveniently for those who are looking for travel in both the water and on land. To continue to value discussion, we have the Joinfree brand. This brand designs minimalized water shoes that can be had at a low cost. The minimalized design keeps the model lightweight for the user and allows for them to emit natural patterns of movement. This is a great play for users who wish to develop better stride patterns or those who are looking to improve upon their posture. Their Summer model is comprised of polyester and spandex materials. The polyester treatment occurs across the outer shell. This makes for a lightweight mold that can adjust to the shape of the foot. The spandex material is utilized at the upper to provide a simple, flexible fit for the user. The insertion point is gapped and enlarged to help the user apply a simple fit. The lighter material combinations also help with chaffing reduction, keeping the fit comfortable and irritation-free for the user. Breathability is a main concern with this model and it is addressed at the upper and the insole. The upper maximizes air flow by widening the insertion gap. The insole takes the same material design, creating a lightweight foot bed that maximizes air flow movements. Partnering these two areas helps to reduce any irritations, heightening the comfort for the user. To continue the minimalized discussion, the outsole of this shoe is thin. This keeps the user as close to the surface as possible, allowing them to purposefully use their strides in a natural capacity. The intrigue of the outsole properties come at the undercarriage. The undercarriage hosts many different shapes and small extensions for increased gripping capacities. This rubberized component is also treated to host the slip-resistant title, proving that there is no surface these models can't travel upon. This design is also wear-resistant, meaning it will no tear or cut on rocky surfaces. This wear-resistant motion also helps resist debris build-up, keeping the traction and stability high in a consistent nature. If you are looking for the perfect beach companion, look no further than the Fanture brand. Their material builds allow for heavy amounts of submersion and host quick-dry functions for walking along the beach. The outsole design also caters to the hard land conditions, hosting properties that benefit stable travel. This model is made from a spandex and polyester combination. The polyester is the dominant material, hosting the greatest amount of coverage on the model. These two materials combine to create flexibility in fitting and wherewithal to withstand heavy amounts of water usage. The outer shell also combines some rubberized usage, creating a web of resistance that protects against abrasions and material tears. The main intrigue comes at the design of the outsole. The outsole features 18 different holes for correct drainage. This helps to prevent against water build-up, keeping this model functioning in the water. Out of the water, these holes act as grooves that can double as traction increasers. They are spaced to provide a full flex, keeping you moving across all different terrain types. The outsole is comprised of rubberized materials. It is thick enough to provide the necessary levels of support from the front of the foot to the back. The pattern covers the natural design of the foot, giving it that minimalized feel to natural stride admissions. At the sides, the outsole is grooved to create separation and develop midsole properties. These layers help to prevent against shock and increase the comfort for the user through the development of a solid foundation and platform. Hosting a sole that operates in the same capacity of an athletic sneaker keeps this model safe to use both on land and by sea. Another dual-purpose brand that hosts usage by both land is sea comes to us from Keesky. Their product molds help to create an even flow of water when submerged, preventing the shoe from becoming bogged down. The outsole is treated to an athletic design for proper traction and stability on land. This barefoot mesh design features an outer shell treatment that keeps breathability at an all-time high. The form takes the mold of netting, producing gapped holes that surround the entire foot. This creates a drainage system that is quick to dry, keeping the transition from water to land smooth. This material wraps at the laces, providing a dual-shield of protection from the elements. A full lacing system allows the user to adjust the tightness, making fitting a breeze. The outsole is made from synthetic rubbers, keeping it lightweight for the user. It is designed with a thick pattern, producing a large platform for push-off and landing. This helps to cushion the blow with each step, working to eliminate levels of shock on the foot. The under-carriage design takes deep grooves, helping to produce both flexibility and proper traction. These thick grooves also work to keep debris from building up, allowing the bottom to purpose as a steady footing mechanism. These elements also produce bounce-back, giving you that extra boost you need on your push-offs. This system works to limit fatigue and keep your movement patterned with a simple course. The insole of the shoe is both removable and features small drainage holes. This drainage system works to keep the fit comfortable in water and helps the interior dry quickly when moving to land. This system also makes a great fit for sandy beaches, limiting these particles from irritating the foot or entering the foot bed. When it comes to water shoe design for coarse terrain, Kenswalk has women covered. Their models take a unique attention to the outsole, providing the developmental means needed for combating the tough surfaces. When submerged in waters with rough coral reefs, we desire a platform that can combat these indifferences. This Kenswalk model is all of that and more. The design of this slip-on model encompasses the use of heavy mesh treatment at the outer shell. Small holes cover this shell, producing the proper means for drainage. A laced upper greets the top of the foot, allowing for a proper instance of lockdown. This keeps the foot from shifting and allows for more stable footing for the user. The insertion point features a reinforced, mesh wrap. This wrap allows for flexibility with the material used and introduces an increased stance on holding techniques. The greatest intrigue of this model comes at the outsole. The outsole is made up of a rubberized component that is treated to be slip-resistant. The treatment mechanism is known as water grain technology and this builds upon the notion of preventing debris build-up. The outsole is teamed to squared cuts at the undercarriage. These cuts cover the bottom of the shoe and are complete cut-outs. The complete nature of these cut-outs allows for a bottom drainage system, which increases proper standing when fully submerged. The rubberized component is even-keeled, meaning these cuts will not put the user at risk of abrasions or ailments. This design also allows for flexibility at the outsole, associating stability to adverse surfaces. This model also hosts a thin midsole for bounce-back support. This helps to eliminate shocks from the movement equation, producing a more comfortable ride for the user. Another model we find to fit the mold of this subcategory comes to us from Yungod. Their production lines scale both the men's and women's spaces, hosting versatility for all different foot types. Their quick dry model is the perfect combatant for taking on rough and rocky coral reefs. This model utilizes the same outer shell materials with lightweight mesh. Holing occurs throughout the entire build of the shell, creating the proper drainage system. This also helps the interior of the shoe dry quick when transitioning from water to land. The intrigue of this model comes at the upper design. The upper features a full, synthetic wrap that protects overtop the foot. The lacing system is carried out in an elastic fashion, featuring a plastic adjuster. This allows the user to adjust the tightness of the model, producing an ample amount of lockdown. The outsole of the shoe features a similar design to the women's model we featured. The same squared cuts are placed into the undercarriage to increase both flexibility and team a draining system to the bottom of the shoe. The sides of the outsole feature ridges which work to diffuse the shocks absorbed with each step. This helps to eliminate some of the pressures associated with push-offs and landing. The back of this model also introduces a wrapped heel counter. This provides stability to a region that features heavy usage rates during your strides. This helps to eliminate internal shifting and produces a solid hold for footing concerns. When it comes to water activities, the youngsters love to join in on the fun. The Wave is a brand that creates suitable footwear means for children. Their aqua socks keep the design simple and allow for the functional means needed for hosting usage in the water. This model is termed with a mesh and rubberized design, allowing for both breathable functioning and a durable build for stability concerns. The outer shell utilizes a heavy mesh treatment, with reinforcement at all angles to reduce abrasions. The upper is treated to a padded insertion point that creates a stretchy, circular hole for the foot. This allows the user to stretch the fabric for proper placement. Once placed, the foot is secured via an internal, elastic rope. This device is tightened via a plastic piece that rests at the rear of the insertion point. This mechanism helps to create a solid hold around the ankle, preventing the foot from slipping out of the shoe. The outsole is treated to the rubberized build. This build extends into the toe box and the rear heel area, providing an increased amount of protection to partner with your strides. The under carriage of this outsole is treated to small grippers that extend from the shoe. They are spaced farther apart from one another, preventing against sand and debris build-up. The extension works to provide the right amount of traction for taking on a multitude of surfaces. This inclusion also works to absorb the shock before it reaches the bottom of the foot. This model is designed primarily for toddlers, but the Wave product lines expands across all different age levels. This gives their products a suitable design for combating the rigors of play. When it comes to water sports and water activities, there is not a brand that features longer success than that of Speedo. Termed mainly as a clothing company, this outdoor giant expands their reach to the footwear category, infusing their knowledge base into an incredible line of products. Their Surfwalker 2.0 model is an expansion into their water shoe product line. This model is designed from synthetic, mesh, and textile materials. The combination of these forces makes for a flexible, lightweight mold. This is important for children, as they often desire something that is comfortable to host continued usage. The outer shell features a backed mesh, creating a panel that extends from front to back, wrapping at the sides. There is a small space left at the toe box and heel counter for the holed mesh. This represents the main drainage areas for this model. This design also allows for proper air flow from front to back. The insertion point is made from elastic materials, allowing the user to stretch to their likeness. The outsole also features a sound design. It is made from synthetic materials, keeping the overall weight low and allowing the user to gain the natural flex of the foot during strides and movements. This outsole features a design that hosts an arch hike, providing additional support at the forefoot area. It is designed to mold to the foot, helping the user find their own base. This helps emit natural strides, push-offs, and landings. The under carriage of the sole is rather flat with finely placed, oval grooves. These grooves cater to the main pressure points of the foot, helping to eliminate shocks and create for a cushioning area for the user to work from. When it comes to applying the necessary means for usage in a boating shoe or sailing shoe, particular attention must be placed to the outsole, overall breathability, and like components. One company that has these factors nailed down is Sperry. This company is primary known for their casual shoe designs, but their extension into the boating shoe space has made them a contender in this subcategory. Their 7 Seas Sport model is made purely from mesh materials, giving it a lightweight build. Side-by-side synthetic paneling is placed to extend from the outsole to the lacing. This provides an increase in holding and helps to promote upright positioning when in motion. The insertion point is treated to an elastic rim, which allows the user to pull and stretch for a simple fitting. The toe box features a synthetic layer surround the cap, creating a defender against stubbing and any abrasion threats. The outsole of this shoe is designed with an athletic mindset. It extends about an inch from the shell, creating a stable platform for the user. It is made of rubberized materials, allowing it to flex to the user's liking. It features spaced cuts and grooves to increase the stability upon slippery surfaces. It is also set without extensions, utilizing blocks of the rubberized materials for even standing. This is important for use on flat, smooth surfaces often found all over the boat. These surfaces are often slick, so it is important to have a solid foundation to rely upon for strong standing and gripping. We stick with the same brand for the men's option, but sample from a different product line in the Sperry collection. The 7 Seas 3-Eye model is the perfect boating or sailing companion. It features the same mesh outer shell, which flexes from all directions. This keeps the foot comfortable during times of travel or when pressures are needed at different areas of the foot. The paneling in this model wraps around the insertion point, creating midfoot and heel support. This paneling doubles as a heel counter. This counter wraps tight, keeping the heel from caving into improper motioning or twisting. The tongue of this model lays flat on the foot and is padded for increased comfort. It is designed with reinforced mesh, keeping the breathability standards high for this model. The insertion point operates with a padded mesh. This allows for an easy flex, helping the user apply the correct fitting. The interior keeps the mesh lining with holes in both the insoles and in the interior walls. This allows water to flea from the shoe, preventing against build-up. This also works to keep the foot dry. The outsole design operates with the same properties across the entire boating line in Sperry's repertoire. This kind of consistency is important for including the correct versions of traction and the proper cuts to keep the user standing strong upon slippery or smooth surfaces. There are small drainage holes included near the midfoot region of the outsole, which again plays an essential role to a high level of overall drainage. As we get into the heavier usage areas such as hiking or wadding waters, we need to increase the strength of the materials utilized. Merrell has this space covered with their Blaze Sieve model. This model is constructed from various materials, citing synthetics, leathers, and fabricated materials as the main usage items. The outer shell of this model takes the same format of a sandal, creating gaps for air flow and drainage. The main difference is that this shell is reinforced, creating multiple layers of materials. This keeps the mold resistant to abrasions and other such threats, protecting the foot. Synthetic extensions come off of the outsole, reaching to the lace area. These are stronger components that double as holding mechanisms. This creates a sense of midfoot support. The toe box is also fully encased, hosting a strong cap to resist abrasions in a high traffic area. The upper is strengthened via the use of leather. This helps to resist the elements, keeping a strong hold overtop the foot and proving to be durable enough to attack the test of time. The insertion point features elastic materials, helping to stretch for an applied fitting. The outsole is designed from synthetic materials, keeping the lightweight notion alive and well. It features thick extensions that are closely shaped and spaced. This helps the user forge any type of surface, creating grippers at all areas of the under carriage. This model is also treated to a Unifly midsole, a proprietary inclusion from Merrell. This midsole helps to absorb shocks and reduce any pressures felt on the bottom of the foot. This can help create diffusion over the course of long hikes or placing additional pressures on your push-offs. Sticking with the same production company, Merrell also extends their reach to the women's footwear space. While this model features the same design and mold, we'll touch on some additional areas of support to help term all the capabilities of this footwear model. We already know the material usage, so we'll save the description to heighten on a few more talking points. The lacing system for this model is carried out with elastic strings. This helps the user pull them as tight as they please, returning to form if left alone. This allows the user to apply the correct amount of holding overtop the foot. The pressure amount is locked-in via a plastic adjuster. This adjuster can be loosened as your travel progresses, which is something wet laces couldn't stand behind. It is recommended to loosen your hold on the foot as you progress your hiking, so this inclusion is an important selling point for the user. Another area that was missed in the previous descriptive was the heel counter. An elastic band extends off of the outer shell. This band is thick, which helps create the inclusion of a heel counter. This creates an ample amount of holding at the heel, an area that encounters heavy usage rates over the course of a hike. The elastic function allows for the user to gain some flex from this area, allowing them to untap natural motions and stride developments. When it comes to assessing the best fishing and kayaking companion, Under Armour would normally become an afterthought brand. This brand caught us off-guard with the development of their Kilchis model. This model checks the boxes for this subcategory, marking it as one of the best options on the men's footwear marketplace. The outer shell is designed from synthetic and textile materials. This gives the shoe the mold of the athletic titles the brand has been known for. This material features holes throughout, creating the breathability stream needed for a quick dry. This design also allows for the proper format of drainage. A full-synthetic, upper greets the lace area. This helps complete a fully protected shell that helps to deter abrasions. The laces are made from bungee chord materials, which give them the elasticity needed for applying the correct fitting and also heighten the durability for taking on the test of time. The midsole of this model is contoured to fit the natural design and shape of the foot. This helps to work directly with your movements, pocketing the pressures and shocks to increase the comfort of the ride for the user. The outsole of this shoe is comprised of rubberized means. It also features surrounding holes that help the interior drain out water. This second drainage unit helps keep the interior dry for the user. The under carriage of this model features extension platforms that rest underneath the toe box and the rear of the shoe. This helps to space the support mechanisms and helps separate the arch for a slight hike. This patterning helps cater to the direct pressure points of the foot and makes each step more comfortable for the user. The extensions make for solid grippers across smooth and slippery surfaces, making a fishing boat or kayak a proper space for hosting usage. Extending into the women's space, we find the Amoji brand. While this company's production might not be as expanded as the other powerhouses mentioned, this particular model makes for a correct fit in the prescribed subcategory. This athletic sneaker is designed with a mesh outer shell. This shell is like a cloth that is backed with thicker materials. While this doesn't create holes, it forms a net-like material that allows water to flow to and from the model. This helps this model hold high amounts of breathability, keeping air flowing and preventing from constrictions. There is also a stitched backing which helps to create a sound heel counter that increases stability in the rear of this shoe. This feature is uncommon to the mesh design, which gives this model a little extra praise. The outsole of this shoe features a similar design as some of the previous models we have mentioned. It extends close to an inch from the shell, keeping it as a solid foundation. It also operates off of a thin midsole layer that is responsible for limiting the shock for the user and increasing the overall comfort with each step. The undercarriage design of the sole features the hollow design, with cut-outs being featured with prevalence across this surface. This helps emit the proper flow of fluids, keeping the interior dry for the user and allowing the user to submerge the model if the environment calls for them to do so. This area also features rubber pods in the regions where the hollow cuts are not prevalent. This adds to the traction increases and teams with the cut-outs to keep debris from building on the bottom of this shoe. When it comes to addressing footwear options for sporty types, it is important to apply the correct forms of grip at the outsole and host the lightweight mold for quick and shifty movements. Aleader is one of the top contenders in this subcategory and their mesh slip-on models mark for the perfect fit for water sports. This model is designed from fabricated materials. The outer shell features a unique design. It takes strands of the fabric material and stretches them from one end of the outsole to the other. Underneath these strands is a thin, synthetic layer, which helps the shoe keep its mold. The shell also features a thick elastic band that stretches across the midfoot area. This creates a central holding unit that ties the natural properties of the toe box and heel counter together. The midsole of this model is made from Solyte materials. This holds properties that are similar to that of an EVA design but does not weigh as much. This provides a cushioning system to the bottom of the foot that also helps to reduce the amount of shock the user is to feel with each step. The outsole of the shoe is thick and features water grip treatment to host usage across slippery surfaces. This treatment also helps the shoe manage drainage control through the small holes placed in the undercarriage of this region. The interior is also user-friendly with the inclusion of the ComforDry sock liner. This lining is light and feels smooth to the touch. This helps to reduce interior irritation that sometime arises from penetration of water. When it comes to terming the correct selection for women in this prescribed space, look no further than the Equick brand. Their Sport Skin shoes are designed with an elegant mold that is all-encompassing to the foot. This merely means that it operates with a greater sense of coverage, keeping the foot fully surrounding. This model is made from fabricated and rubberized materials. The outer shell is where the fabricated means are utilized. This material is a little heavier than cloth, but it features the same air pockets for the proper air flow. Addressing the breathability concern also helps start the drainage discussion. The interior of this model is lined with mesh materials, which feel smooth to the touch. This helps keep irritation away from the foot. The interior is also spaced evenly, helping to increase the size and flex of the toe box for natural toe splaying. The outsole is designed of a thin rubber. The thin layer relates directly to helping the user access natural movements and flexing. It reduces upon the constriction and gives the user the freedom they need to travel across differing terrains. It helps them rely more on their natural movements and less on supportive means. This keeps the foot in a healthy state. Aside from the minimalized build, the outsole is also treated to an anti-slip design. This helps the user keep their footing on smooth and slippery surfaces, making it a great companion for the mentioned water sports. There is also a protective toe guard included as a separation from the outsole. This helps extend the function of the outsole to the toe box and surrounding areas, keeping protection high and functionality prevalent. When it comes to snorkeling and diving, the appropriate footwear can make the major difference between success and failure at the desired activity. More times than not, flippers and specific equipment should replace footwear selections. If you find yourself without the necessary equipment, this substitute from Speedo will do the trick. The Surfwalker 3.0 is the third installment into an incredible water footwear line. The same material build of Speedo's dive suits goes into the production of this footwear model. This helps keeps the user at ease knowing this material is tried and tested in the desired area of usage. This Speedo model relies heavily on textile and synthetic means. Levels of textile reinforcement are utilized at the outer shell to increase protection and reduce abrasions for the user. The reinforcement coverage is almost a complete cover, but smaller mesh pockets are included to keep the interior breathable and drainable. The famed elastic upper keeps the shoe stretchy and helps the user create an applied fit. This insertion point is also narrow and not as extensive as similar, comparison models. This is important because it helps to create a tighter hold around the ankle area. This keeps the shoe fully on the foot through the vigor of submerged kicking when diving or swimming across the water surface. The synthetic sole is lightweight and helps the shoe feature an even pattern of weight distribution. This helps keep the shoe in the minimalized space while also increasing the overall comfort for the user. With an even weight distribution, the user is allowed to increase their kicking efforts and increase their stamina. It helps the user reserve their energy and focus it on the activity at-hand, not being reduced or help back by a heavier outsole. If you are not donning the proper snorkeling or diving equipment, it is best to reduce your weight of your footwear. The weight reduction is directly associated to natural movements. The user also tasks their body when they are attempting a dive, utilizing many different muscles and extremities to reach their destinations. A lightweight fit helps apply the perfect mold to this notion, marking the H2Odyssey Neoprene Fin socks as the perfect companion for these water activities. Neoprene is designed and functions much like a spandex material would. It helps grip to the foot but doesn't cut off any circulation. Neoprene is also softer than spandex, meaning it won't cause the foot any irritation. It is also highly breathable, keeping air flow at bay. It also comes with an elastic upper that is thickened to increase the hold and reduce the rubbing at the ankle region. The undercarriage of this find sock also features smaller padded extensions that apply grip to any surface. They are treated to a slip-resistant design, allowing the user to gain the proper footing, no matter the surface they are attempting to scale. There is also stitching the surrounds the toes. This is important because it helps create a set space for the toes to pocket themselves. This helps to keep them free to move and away from any constriction that would be associated with a tight hold. This model looks and feels like a compression sock, but its described properties fully detail how this model would make for the perfect fit for snorkeling or diving. When It comes to hosting usage at a waterpark or via water aerobics, you are going to be searching for something with long-standing. Waterparks only feature so many pools and are often surrounded by pavement. This equates to a lot of trotting and walking on hard surfaces. One model that helps combat the rigor of the waterpark or water aerobics would be the water shoes offered by Zhuanglin. These shoes are made from primarily fabric materials. This build is stronger than a mesh design and hosts similar breathability/drainage properties that a mesh would. The outer shell features the webbed design, with holes for infusing the breathability and drainage functions. This model also features elegant amounts of stitching to tie the materials together. This simple technique helps the model keep the desired mold with the lighter fit, which is something that can't be stated for similar comparison models. The insertion point is reinforced to create a small layer of padding that overlaps this area. This allows the user to stretch it to their likeness for an applied fit. The padding also helps keep the foot inserted, creating a seal that keeps the foot from slipping out. The midsole operates via Solyte technology, keeping it lightweight for the user. This technology is associated to ample amounts of bounce-back, increased amounts of padding, and a defense system to shocks and pressures. The outsole of this model is thick, which is an important notion for hosting long-term or extended wear periods. The bottom features the hollow cuts that help infuse drainage spouts all across the undercarriage. These cuts are met by stability stints that level with the surface. This is good for keeping the user stable and comfortable. This system also works to reduce debris build-up. One of the differing designs for this space comes to us from Cior. We wanted to introduce a model that featured a differed mold but didn't compromise on function. This model is the perfect fit for that description. This women's model features a very long insertion point, directly comparable to that of a women's, casual slip-on shoe. Overtop the insertion point is an elastic band. This band features a Velcro-like adjuster that holds strong when fully submerged in water. This makes accessing this model a breeze for any size foot. This strap also helps create the proper lockdown overtop the foot. The mesh and synthetic material combination comes full-circle with the two synthetic caps. One is placed surrounding the toe box. This reduces stubbing and abrasions. The second is placed at the heel to create the proper rise for a heel counter. This keeps the heel from shifting at the interior and relates directly to proper posture development. The outsole of this model is made from rubberized compounds. It fully stretches from front to back and even laps the midsole to feature additional supports for push-offs and landings. The undercarriage of this model is treated to small, shaped extensions. These extensions completely cover this area, helping to keep traction on whichever surface you are to travel, in or out or the water. When submerged these extensions double as smaller suctions, helping you to glide on the bottom of the pool and perform the correct movements needed for water aerobics. Out of the pool, they will keep your supported in a consistent basis thanks to the close spread of their design. When it comes to terming the best water sandals, we have to consider the absorption capabilities of the material. Most sandal soles will absorb water and will have a difficult time drying it out. When submerged, these mentions can weigh you down and be rendered useless. Thankfully, Teva took control of these concerns and fully addressed them with their XLT model. This model is made from a polyester webbing. The webbing features smaller holes that keep the water from soaking down the shell. This webbing is teamed in different locations, strapping to the toes, the sides of the foot, overtop the foot, and around the ankle. This is concerned a reinforced build for a sandal, due to the many different holding patterns at-use. The outsole of this sandal is a compounded rubber material. It is treated to create a firm base. Overtop the base rests a treated insole that keeps a comfortable foot bed for the user. This construction and design does not sacrifice comfort for function, which is something that works in the favor of the user. The outsole is also designed with Durabrasion technology at the undercarriage. This lugged design defends against cuts and tears, keeping the sides and the undercarriage protected. This treatment also keeps this model a durable build that will withstand the test of time. Merrell is one of the top defender brands on the market, so it is only fitting they find mention within this subcategory. Their Hydro Monarch water sandals are designed with heavy levels of reinforcement and are treated to the top extent for usage in water. This model takes from many different materials, citing leather, mesh, and synthetics as the main inclusion pieces. Most of the model utilizes synthetics, with slight attention to leather and mesh undertones. The wraps are all synthetic and each comes with a Velcro-like fastener at the outer shell. This helps create many instances of self-applied holding and lockdown. They are also easy to adjust and loosen, keeping you comfortable no matter the situation. The leather inclusion comes to fruition at the upper. This helps the straps rest comfortably overtop the foot. The leather design also keeps the foot from becoming irritate from rubbing or contact. The outsole is designed from a synthetic mold that takes from rubberized compounds. This dual-fusion technology keeps the overall weight of the product low. The outsole is also waterproof, resisting the urge to absorb this moisture. This is important because it allows you to wade through the water with ease. The undercarriage of the outsole features small cuts and grooves, helping you to find your footing no matter the surface traveled. This undercarriage is also treated to resist slippage. A full heel counter is developed at the rear of the shoe. It is attached to the outsole, helping it apply a sound mold for addressing any stability concerns. 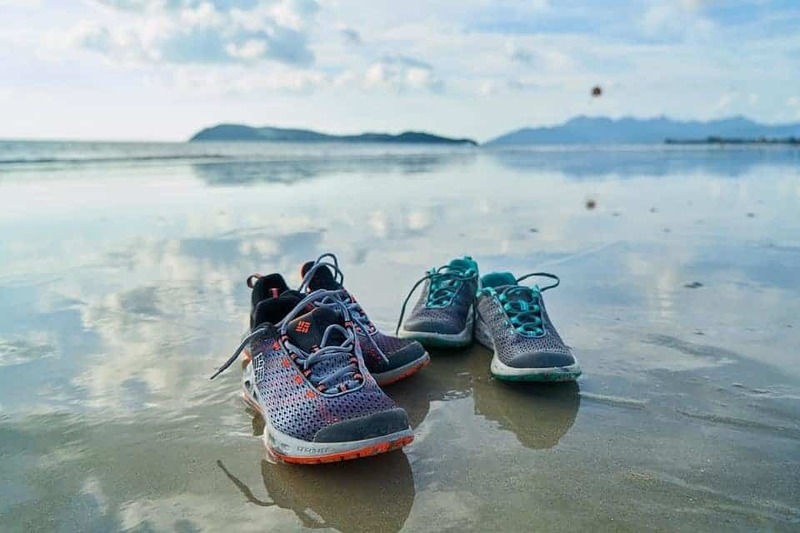 After diving through the many different subcategories of water shoes, we have come to a conclusion as to which product would best suit a multitude of the prescribed needs. One of our favorite brands to feature was Merrell, with the All Out Blaze Sieve water shoe taking the cake for to All Out Blaze Sieve contender. This model held intrigue to all subcategories. The first area this model excels is via the build. It looks like a sandal was stacked within a second sandal. The crisscross design is perfect for creating a strong mold and still emitting the proper streams of air flow to the foot. The all-purpose outsole was also something that could be utilized in almost all environments and settings. The weight concern becomes an afterthought due to the consistent air flow. The weight distribution is also as close as it gets when comparing outer shell to outsole. Most of the mentioned water shoes will prescribe additional areas of usage, but we mainly focused on the main components today. When you are accessing your searches, look for different usage lists. Most models list a bevy of them. You can than apply the knowledge base we introduced as to the specific components to look for within the subcategories. Apply this knowledge and you'll find the correct fit. Sporting Goods: Find out why water shoes are essential for boating, paddle sports, and other outdoor and aquatic activities.